3 travel size laundry packets, 0.17 fl oz each. In plastic outer container. 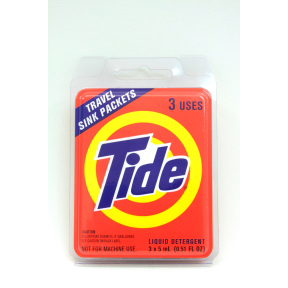 Travel sink packets. Not for use in washing machines. Contains no phosphates. Safe for septic tanks. Ingredients include biodegradable surfactants, (anionic and nonionic) and enzymes.